System FixZ-7 « SP Green Energy Ltd.
- Light elevation on trapezoidal sheet metal roofs (eleavtion angle 5 – 7°) for framed modules. 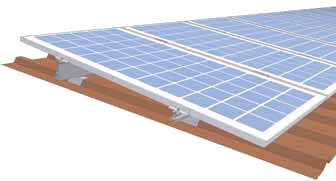 - Designed for framed modules with heights of about 1.3 – 1.7 m in vertical mounting. - In most cases, the fastening to the substructure is done using trapezoidal sheet metal clamps.